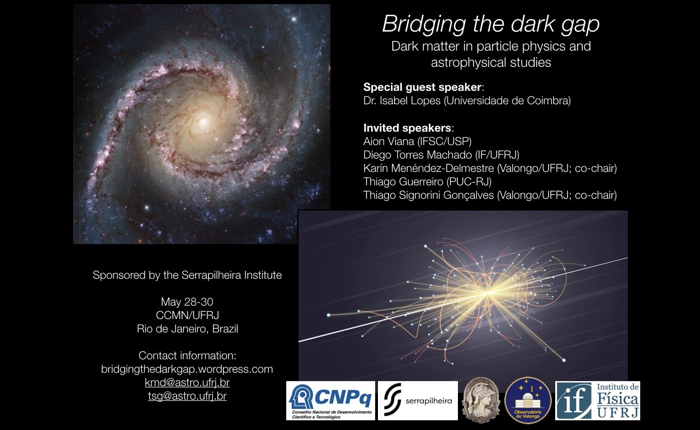 Join us in our 3-day event that seeks to establish a Rio-based local node of interdisciplinary discussion on dark matter. The format will be that of a medium-sized school tuned to the level of Physics and Astronomy graduate students in an effort to reach a wide audience of researchers active in the fields of Experimental and Theoretical Physics, as well as Theoretical and Observational Astrophysics. Advanced undergraduate students are also encouraged to attend. Mornings will be devoted to a 3-lecture series offered by Isabel Lopes (Universidade de Coimbra), member of the Executive Council for the the LUX-ZEPLIN Collaboration, with a focus on direct detection. To complement, the 3 afternoons will be devoted to 3 crucial aspects of the dark matter search: (1) indirect detection, (2) astrophysical perspective, and (3) “putting it all together”.